Amsterdam is well know for its rich eclectic selection of art from the amazing Golden age. Today we have a new form of art that is a great part of our city: Street art! Did you know that Amsterdam has lots of amazing street art all over the city? We even have an area that is completely devoted to street art! If you’re lucky you could even see a street artist in action during your customised and private tour of Amsterdam’s finest street art. Our experienced local street art expert and photographer will join you on this bespoke tour and provide you with all the ins and outs of our street art culture and he can assist and teach you how to make the best shots on your smart phone! 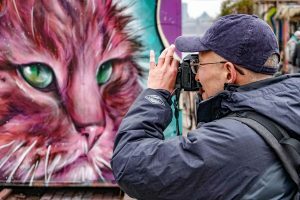 Join us on a Private tour of Amsterdam and discover all the best street art spots with our street art expert and photographer. Get in touch for a one of a kind experience!